We have had a lot of fun putting together this Holiday Gift Guide. Probably one of the biggest highlights of doing our daily product feature for the Mind Body Spirit Marketplace Facebook Page is getting to see all of the wonderful items available online that have been created to educate, nourish and heal the soul. Nellie and I are happy to be able to share a selection of our favorites with you this Holiday Season. Some of these items are traditionally manufactured and sold. Others are handcrafted and available from independent shop owners. Some items are new, others have been on the market for a while. In addition, at the end, we have also included a list of links to those people who have contributed so generously to our blog over the past year. Lots to look at and enjoy! I'm sure you'll fine something for everyone on your list...and even yourself! 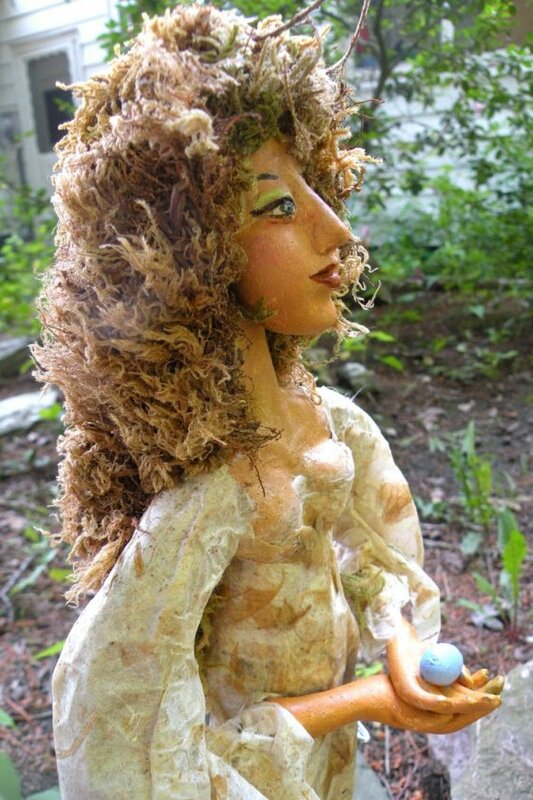 Sophia, Wisdom, Mother of All... her power and beauty are celebrated in this one of a kind and completely handcrafted art doll by Vermont artist Colleen McLaughlin. 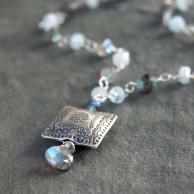 A stunning and special gift for Hanukkah, Yule, or Christmas. I'm starting my list with Sophia - she represents our seeking, our highest truths and spiritual gifts, and she (the doll!) also represents something I believe in on a more mundane level - supporting artists and artisans directly, while gifting others with items that are truly unique. When I first read this book, I was stunned. Since I was young I have been fascinated by ancient Christian mysticism and the Gnostic gospels. My spiritual path has taken me far and wide, but I continue to feel drawn to these works and traditions. The Coptic Gospel of Mary Magdalene was discovered fifty years before the Gnostic gospels found in Nag Hammadi, Egypt and is considered a source text. 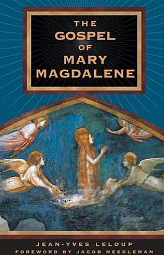 Not only does this text, combined with Leloup's commentary, tell us more about Mary Magdalene and the role of the divine feminine, it (possibly more importantly) provides us a somewhat surprising view and understanding of early Christian thought. 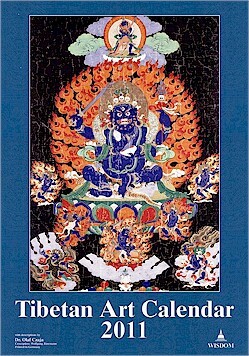 I found it akin to Buddhist and Taoist teachings in many ways, its wisdom inspiring and illuminating. With all the hundreds of tarot decks available, and with all the new ones that were published this year, I have to admit it was easy to choose Sun and Moon for this Gift Guide. The artwork is beautiful, inspiring, and accessible, with an unmistakably positive energy; the symbolism is striking - adeptly inserted into the imagery and based on real scholarship and study; great "little white booklet" that provides insightful instruction and accurate interpretation - helpful to both inexperienced and seasoned enthusiasts; and of course, the high quality of US Games. 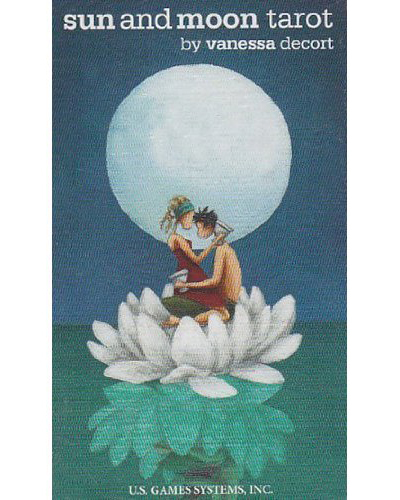 This deck would be a great gift for anyone interested in tarot or divination, who especially love diversity and cross-cultural spiritual seeking. Tarot decks make a great gift, often being kept and treasured forever. I have the very first deck I was ever given, by my dad's close friend - it no longer has its box, but it is kept safely with my other favorite decks. Like everything created by Baba Studio, this little bag is beautiful. 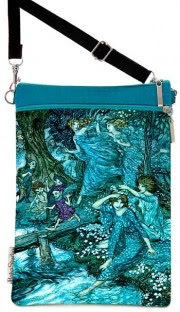 It is exquisitely crafted in pure silk, featuring a lovely scene of fairies based on an illustration by Arthur Rackham. These sling bags are the perfect size, especially if you are like me and aren't crazy about carrying purses. I have found them to be large enough to fit a wallet, cell phone, keys, pen, lipstick, notepad, and small camera (now you know all my essentials!) in two lightly padded and zippered pockets. 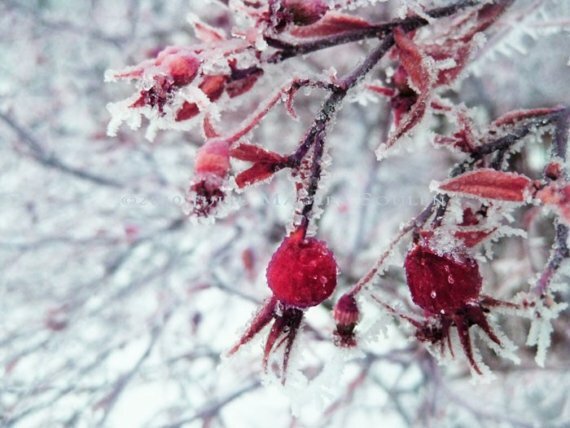 The winter holidays are such a magical time, and Fairies fit the season perfectly. Please visit the shop and take a look around though, these bags are offered in many different designs from Alice in Wonderland to Gothic to Tarot, and there are other styles of bag as well, from small pouches to large bucket, messenger, and laptop bags. Anything from Baba would make a wonderful, magical gift. Every May we are blessed here in Vermont with the gorgeous, irresistible scent of lilacs, in farmhouse gardens and along country roads. There’s nothing like it and it truly symbolizes the end of the colder months of the year and the beginning of spring. Sylvie, through some magic known only to her, captures this beautiful scent in her luxurious, natural, handmade soaps. Wondering if the scent lasts? 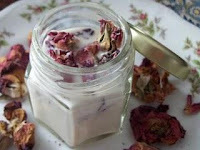 I can say from experience that the scent lingers subtly through the day, and the bar itself and the freshness of its fragrance, last remarkably well for months. 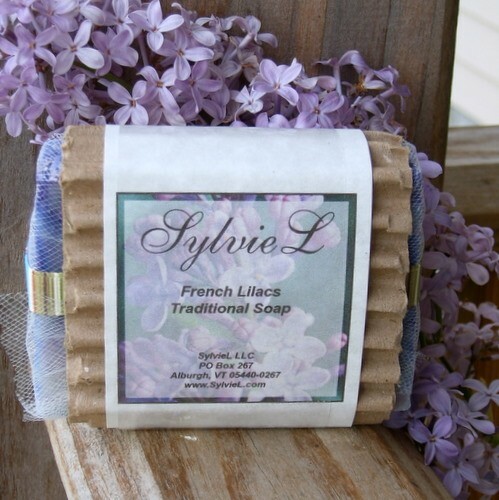 Sylvie's soaps are packaged beautifully for gift-giving. This bracelet is gorgeous, in bold turquoise with a contrasting black cherry blossom design. 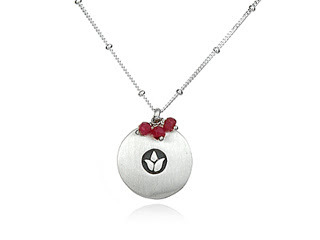 I just love this shop... Asian inspired jewelry, handcrafted in smooth, cool polymer. These are unique, beautiful, very wearable pieces. They are also incredibly affordable. My husband and I discovered this beautiful series over the summer, and I'm happy to recommend it, as I believe it encourages optimal health - physical and spiritual, throughout each of the seasons. It is also simply a joy to listen to. From the website, "According to ancient Chinese medical theory， there are two causes for diseases. 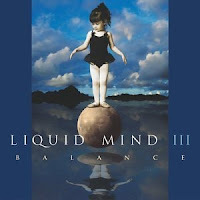 The first is internal， which is brought about by an imbalance in a person`s psycho mental state. The second is external， which comes as a result from changing atmospheric and climatic conditions. 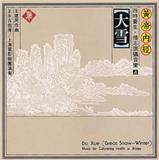 This six volume set of music developed in mainland China is based on these principles of health preservation. Volumes 1 through 4 are designed to counter external causes of illness by strengthening the bodies` natural defenses against particular conditions found in each of the four seasons. Volumes 5 and 6 are designed to counter internal causes of illness by regulating psycho mental activity， and thus bringing the body and mind into a state of equilibrium and harmony." These are fabulous calendars, the artwork deep and breath-taking and the quality suitable for framing (and indeed we have framed them in our house). I started shopping at Snow Lion years and years ago, having been a reader of their terrific magazine and catalog (I would spend hours looking through it). 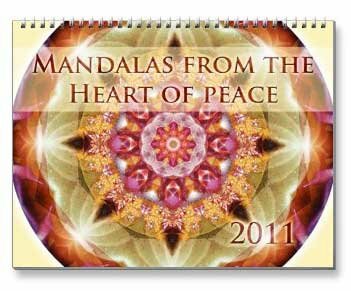 So many of us give at least one calendar as a gift every year; this one is also a gift of art and a gift of spirit. There's a wonderful variety of gift ideas on the Snow Lion website - books, ritual items, statues, incense, jewelry, meditation cushions, prayer flags, and more. When I first opened this book, which was received as a gift, I didn't know if it was meant for children or adults. It holds allure for both. Its brittle parchment jacket is reminiscent of ancient secret manuscripts; and beneath, it coyly reveals a colorful drawing of the forbidden city of Lhasa, true home of the Dalai Lama. This first impression of the book makes it quite special – as what is inside is neatly hinted at, with invitation to enter. 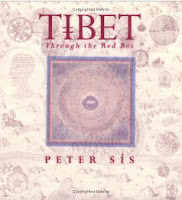 It is most literally an adventure book of Tibet, but as well, it is a fairy tale. Suitable for children ten and up, enjoyed by anyone with a love of Tibetan culture. 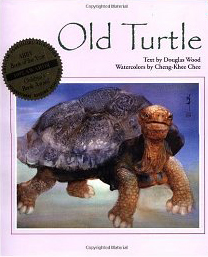 Old Turtle was one of my daughter’s favorite books as a young child – and as her mother, it was one of my favorites for her. It is a beautiful and powerful book that is just so easy for a child to understand and appreciate. For children and adults alike, it can teach important truths, about God, diversity, caring for and listening to the Earth, and tolerance. Although the book was first published years ago, the story is timeless. If you haven't yet given this book to a child in your life, it just might be time to do so! 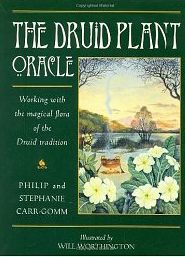 The Druid Plant Oracle is a deck and book set by the same authors and artist of the Druid Animal Oracle, one of my favorite oracles that I received as a Christmas gift years ago. In the Druid Plant Oracle, Philip and Stephanie Carr-Gomm explore the significance of thirty-six plants used and honored in the Druid tradition. This is an engaging set, inspiring us to work more closely with the trees, herbs, flowers and fungi that surround us, and to learn from their gentle wisdom. A lovely gift not just for Druids and pagans, but for lovers of nature and green growing things as well. Perfect as a stocking stuffer, especially when given with the promise of a massage! When I was experiencing sciatica this year, Healing Earth’s Aches Away massage oil provided gentle soothing. It’s a lovely, effective blend with a subtle, pleasant scent. I was lucky to have this product available locally - I seriously went through at least four bottles, but it’s also available online for all to enjoy. Please visit the Healing Earth shop for more - they offer a nice selection of oils, salves, creams, and balms. This CD has the honored status of being the only piece of music that I have ever inquired about after a class. 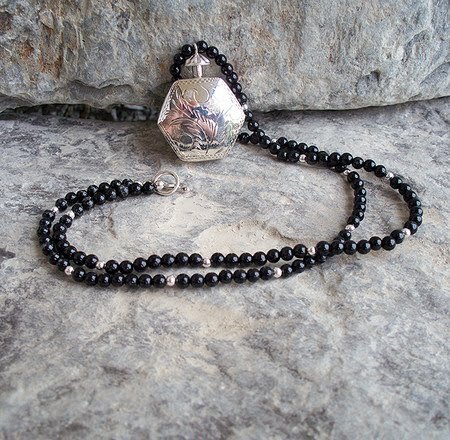 Perfect for meditation, qigong, yoga or Tai Chi practice. Or if you just need to relax. If you are not familiar with Llewellyn's yearly Almanac publications, you really should take a look. Chocked-full of educational information presented in a friendly and enjoyable manner, the Herbal Almanac features articles from a variety of authors on herbal and botanical related subjects. For those people interested in gardening, herbs, cooking, herbal remedies, essential oils, or aromatherapy...this is a perfect and affordable gift. 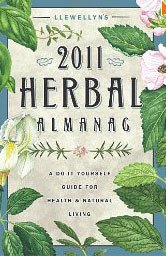 I look forward to my copy of The Herbal Almanac every year. 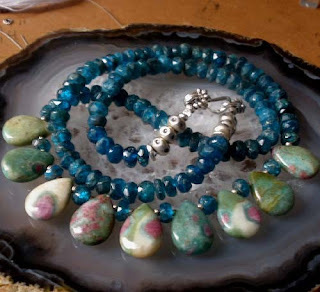 The thing that sets Abby Horowitz apart from other jewelry artisans, aside from her amazing sense of design, is the individual care, thought and attention to the healing properties of the stones that go into making her one-of-a-kind pieces. 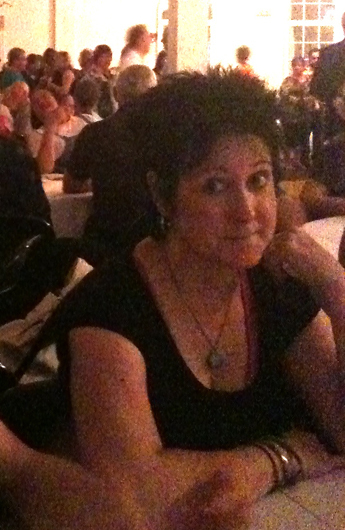 Earlier this year I had to attend an event where I knew there would probably be a lot of negative energy thrown around. I purchased one of Abby's turquoise bracelets to wear (turquoise will absorb negative energy), never took it off...and sailed through the event on a cloud. When I talked to Abby about it later her reaction was "Glad I could help you with your Metaphysical needs"! Me too Abby! I found this through an obscure reference in an article about Esoteric Astrology. The original copyright of this book is 1941. At the time it had been published Reconstructed Letters was given as a free supplement to new subscribers of a magazine called "The Astrological Bulletina". It is currently available re-published as part of Kessinger Publishing's Rare Reprints. I find Reconstructed Letters unusual not only because it is so old and re-printed in it's original form, but also because of it's content. When I finished reading it I felt that all the basic seeds of Spiritual, Religious and Esoteric knowledge had been planted within these pages. It is most definitely a forerunner to current, modern day "New Age" and Spiritual publications. This book is a must for anyone interested in spirituality, religion and astrology. This was probably one of my best online shop finds this year. Alli Pacha has had over 1,300 sales in his Etsy shop. He carries a huge selection crystals, minerals, smudges, pendulums, medicine bags and much, much more. I ordered some candles along with the smoky citrine, pictured on the left, and was very pleased with my purchase. Alli Pacha's Shop is also contains a wealth of educational information about the items he carries. Good resource. Oh gee...where do I even start with Delores Cannon? I discovered her books this year and felt like I had taken a giant leap forward in my Universal perspective of.... well, "everything"! 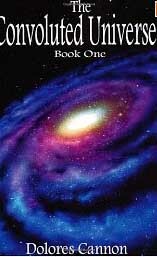 Convoluted Universe Book I is the first in a series of 3 Volumes, the 4th is on the way. Don't even bother to even open this book unless you have at least 2 or 3 hours available. You won't be able to put it down. (This has happened to everyone I have recommended the book to). Delores Cannon began her work as a reporter, international investigator and researcher of "lost knowledge" in the 1970's accidentally through her work as a regressive therapist. By taking her patients into the somnambulist trance state (the deepest possible trance state), Delores was able to tap into much more then just a simple past life reading. In this book, Delores explores such mysteries as the knowledge and destruction of Atlantis, Easter Island, Ark of the Covenant, the Pyramids, Loch Ness Monster, Nazca Lines, Parallel Universes and more. Whether you believe what you read in this book or not... it's without a doubt the most interesting mind candy I've had in years! Pick up a copy. 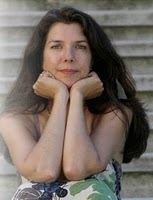 It is a combination of several qualities that set PattyMara Gourly apart from other artists. Her superb command of her craft, attention to detail, material choices, and a exuberant creative spirit that seems to burst out of just about everything she makes. Whether she's silk painting, creating items to celebrate Day of the Dead or making her fabulous pottery (which is in huge demand), PattyMara Gourley has the magic touch! You can read about my adventure with the Buddha Teapot we purchased from her on a blog post we ran earlier this year. Check out PattyMara's shop on Zibbet to find a wide range of beautiful gift items. 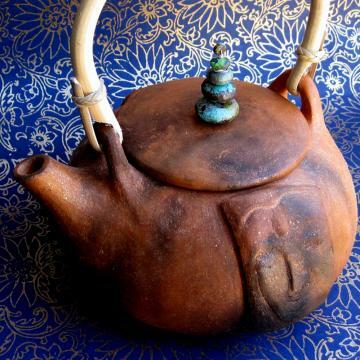 you will find numerous links to her wonderful artwork and designs. 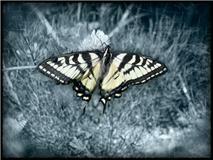 I have been more then pleased with the items I have ordered of her work through Zazzle. Her 2011 Calendar, pictured on the right, is just stunning. I was so happy when I found this wonderful Tea Shop on Etsy...and even "happier" when I received my order and tried these tastey teas for myself! Dream Weaver offers a nice variety of hand blended Black, Green, Chai, herbal Teas and herbs at a great price. Each package makes around 14 to 16 cups of tea. They have a money back guarantee, but with over 440 sales on Etsy they must be doing something right. A great gift or stocking stuffer for the tea drinker on your Holiday list! 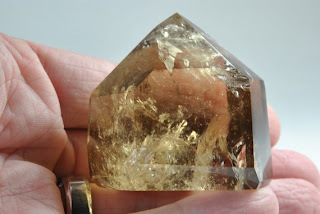 I've been a fan of Satya Jewelry for a number of years, and I'm always surprised at the number of people who are not familiar with them. Spiritual, quality jewelry at an affordable price, this New York based company has their products available online, in their own stores and also in many gift shops and boutiques throughout the country. Satya participates in a number of various Charity related activities too. Their most recently campaign was in conjunction with Haiti Relief featuring Patricia Arquette. Check them out... One of my favorites! 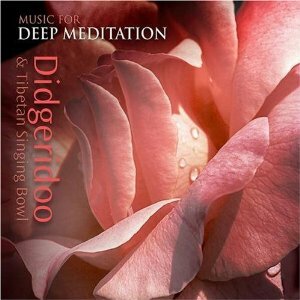 This is a deep meditation CD that manages to perfectly balance the energy of the Earth (the Didgeridoo) to the energetic connections of the Heavens (Singing Bowls)...all brought to center/presence with the very subtle, quiet sounding of the gong. I was so happy to find this CD. My son plays the Didgeridoo, which I miss hearing...and my dear, Teacher always ended his sessions by playing the Singing Bowls during our final meditation. Two polar opposite complimentary sounds perfect for meditation. 12. Handcrafted Meditation Benches and Shrines by Ken Cayer on Artfire. Every once in a while I come across a seller that makes me sit back in awe. That was my reaction when I saw these extraordinary, handcrafted wooden meditation benches and alters by Ken Cayer, The Yankee Woodsmith. This is high end woodcraft at it's best. 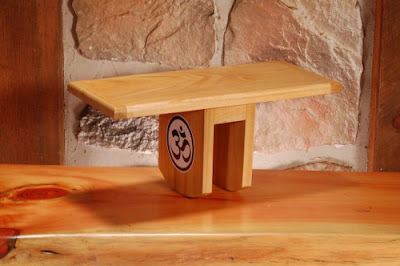 If you meditate, practice Yoga or qigong or are looking for the perfect gift for someone who does...visit this shop! What a stunning collection of gifts. I'm going shopping! !